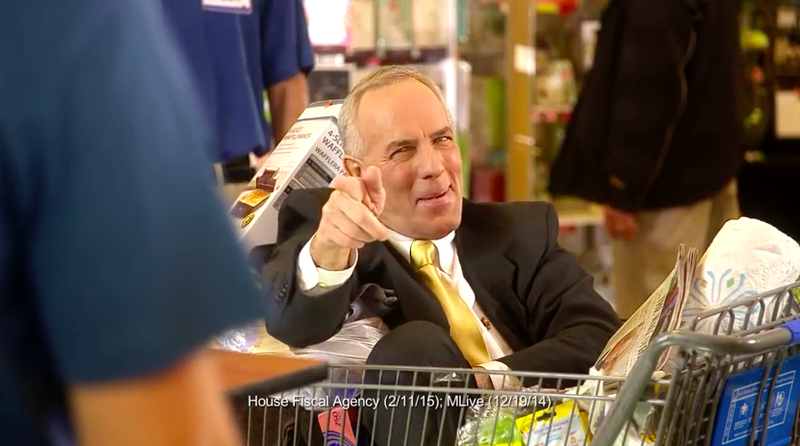 A woman checks out at a store, and gets more than she plucked off the shelf: A sleazy, suit-clad “special interest” man who lounges in her cart, running up her bill and just being a pain in her neck. Proposal 1, the implication is, ensures that everyone will end up paying taxes that go to special interests. In another, similar ad, the same special-interest man sits at a big desk, cigar in his fingers, counting $100 bills into piles like Scrooge McDuck. A whispered voice-over makes the same claims as in the first ad, so we’ll take the text for one to serve for both. "(Proposal 1) gives Michigan one of the highest sales taxes in the nation. Lansing politicians say the tax is for roads… but nearly forty percent goes to special interests." Proposal 1 gives Michigan one of the highest sales taxes in the nation. True but misleading. Should Proposal 1 pass, the sales tax would rise from 6 to 7 percent, joining five other states at that level, second-highest in the country. (California sits at the top, at 7.25 percent.) But that’s not the whole story, as a glance at that link reveals. Michigan is one of 14 states that have no local sales taxes piggy-backing onto the state rate. When local taxes are taken into account, a 7 percent sales tax would have it clustered around 20th in the nation. Lansing politicians say the tax is for roads… but nearly 40 percent goes to special interests. Proposal 1 is one complex piece of legislation, comprised of a constitutional amendment (what voters will be asked to approve), connected to 10 different bills, which only go into effect if the proposal passes. It’s complex because it aims to pull a tablecloth off the budget table without breaking any dishes. In its extreme shorthand version, Proposal 1 is called a solution for roads, but even its supporters’ 30-second ads have said it’s for fixing the roads while also protecting funding for schools and local governments. Equally problematic is the ad’s claim that a good portion of the money is going to special interests, a reference to funding for schools and local governments. Here’s the deal: Every time we fuel our vehicles, Michigan charges us 19 cents per gallon and 6 percent sales tax. The former is used for transportation funding, the latter goes into the general fund, where it does what general-fund dollars do – funds government functions, mainly education and revenue sharing to local governments. Taxpayers have expressed frustration that we pay fairly high gas taxes for such awful pavement, and Proposal 1 is supposed to fix that, making sure all state tax money collected at the pump goes to roads. But taking fuels out of the sales-tax base would blow a sizable hole in the state’s School Aid Fund, something Proposal 1 seeks to avoid by raising the tax by a penny per dollar, or 17 percent. Are education and local governments special interests? The term generally refers to groups that try to influence government on behalf of industries, businesses or causes. Under that definition, the label is difficult to justify. Most folks, whatever their politics, would probably agree that public education goes to the very core of what we expect from government, and local revenue sharing, besides supporting police, fire and other functions, isn’t just a Christmas gift for municipalities, it’s what’s due them from sales tax collections and is enshrined in the state constitution. Proposal 1 is a big fat piñata for its opponents to swing at – the tax increase; the fact it not only makes schools and local governments whole from losing sales tax revenue on fuel, but actually increases their share; or just the fact the proposal has so many moving parts. It’s confusing to voters. But this ad misleads, mischaracterizes and, on the allegation regarding special interests, is just plain wrong. Foul. One might argue that the MEA is a special interest. Tom, You're absolutely correct. This Truth Squad did not mean to suggest that education, municipalities, etc., do not have their own, very influential lobbyists in Lansing. Rather, the point being made is that government’s basic funding of public education and revenue sharing are part of its core functions, and not the type of industry back-scratching that we suspect people think of when they think of special interests. Finally someone other than the Yes campaign acknowledges that education and local government are NOT special interests. Oh and by the way Michigan exempts food from its sales tax which makes the ad with a grocery store clerk particularly misleading. Some of the items in that cart may be taxable but most probably are not. And the sleezy "special interest" representative doesn't look like a school child to me. Good point. Groceries aren't subject to sales tax. By not taxing food, the sales is far less regressive. It is quite a misleading ad. The increase in the fuels tax (not the sales tax) seems to be very large - doubling the current one. It is the amount of catch up that is mind boggling. The whole proposal reads like a shell game. The bill's complexities will likely bring about defeat. Notwithstanding the objective of keeping schools and local governments in a "hold harmless" position, there is deep suspicion that funding was rounded up to the hold -harmless folks. And yes, many of us think the NEA is as much a special interest as any road builder. The legislature missed a great opportunity to directly attack the roads problem with a strait-forward (KISS) Keep It Simple Stupid proposal - like perhaps, leave the pump taxes alone, and put the whole additional 1% sales tax to roads. THAT I would support! Road taxes should be for roads, school taxes should be for schools. If one is to eliminate the sales tax from fuel, then the fuel tax should cover fixing the roads. This, IMHO, is akin to the users of roads pay for what they use. Of course, we can argue about and change things like truck weight limits, the amount of sales tax on Diesel fuel, and even the tax on oil and tires. But this makes it fairly clear that what is collected from the users of roads is going toward the roads and not toward another category. Since the former sales tax on fuel puts a deficit in school funding, a second argument is whether we increase the sales tax to fund schools, or reallocate what is in the general fund so that more is available to fund schools. If we don't want to increase the sales tax, then we have to decide what current expenditure do we want to eliminate. State revenue sharing is a fairly new (within the last 50 years or so) expenditure and one has to question whether all revenue sharing projects are really necessary, as one example where more school funds could come from. Proposal 1 should be very clear, not the mishmash of confusion that it is today. For this reason, I vote no to Prop 1. What is the point of this shell game? If you cut the sales tax from 6% to 3%, you would have to cut "Tax Expenditures" by enough to make up for that loss, plus enough to fix the roads. The citizens of Michigan would be paying as many dollars under that approach as they would be under Proposal 1. Local gov. have been cut for a number of years, unlike schools which everyone wants to protect. Check with the Michigan Township Association , to get the true amount of how our Michigan reps have short changed people over the years. Look at all the gov. departments that have a hand in the rev. sharing pie. Schools on the other hand with their powerful MEA can demand and most likely get anything they want or need. Prop. 1 was for roads only, a one percent hike to repair roads and bridges. Not all these other handouts that our elected bodies seems to fail at fixing. We would not be in this mess if our elected leaders would lead instead of follow! All these criticisms are perfectly valid . . . no doubt. My question is should we fix the roads or not? If we are going to fix the roads, where is the money going to come from? I haven't heard anybody say that we can fix the roads without more money. The Republicans and Democrats have worked together to create this compromise. In my opinion, this cooperation should be supported. If we don't fix the roads now, when will we get another chance? Does anybody think it will be cheaper in the future if we wait? Working together for a compromise doesn't mean its a good solution or deserving of being supported just for that reason. There will be another chance when this proposal fails at the polls. It might not be cheaper in the future, I don't really care, this proposal is just plain bad from so many angles. Did someone forget to include the road builders as special interests? They are the ones behind save our roads, not school bus drivers and teachers and soccer moms. The school funding and mass transit parts should have been left out. It would have been much simpler to ask for a 1 percent increase on sales tax dedicated to road repairs. Nothing more. I am sure the MEA saw a chance to get more money and forced its way in. I also understood the money isn't actually for the schools, but to make up for the shortfall in the teachers retirement program. How come teachers have not had to move to a 401k like everyone else has been forced to over the past several years? At one time, not that long ago, there was enough money to repave every state highway in the fund, until it was discovered by lawmakers and money was diverted elsewhere. Teachers have been forced into 401k plans for a few years now. The ones still in pension plans were force to contribute more a few years back if they wanted to retain the same benefit level at retirement. Charlie where have you been in the last 20 years??? School aid funding has steadily gone down forcing schools to make devastating cuts. Funding has gone down but the cost of running a school district continues to increase. Calling education a special interest group is ridiculous. Providing the funds for quality education shouldn't be an option but a non negotionable item.